THE ALLMAN BROTHERS BAND / FRIDAY MUSIC 180 GRAM AUDIOPHILE VINYL SERIES CONTINUES!!! CELEBRATING 25 YEARS OF THEIR CLASSIC MASTERWORK "WHERE IT ALL BEGINS"
FIRST TIME STRIKING GATEFOLD COVER ARTWORK PRESENTATION WITH 24" x 24" FULL COLOR POSTER! FEATURES CLASSIC ALLMAN TRACKS: "NO ONE TO RUN WITH" "SOUL SHINE" "ALL NIGHT TRAIN" & "MEAN WOMAN BLUES"
The Allman Brothers Band will always be known as one of the first rock super groups of the late sixties who had a knack of mastering rock & blues grooves drenched in gospel, soul and country rock. With a plethora of amazing albums over their 5 decade career, The Allman Brothers Band truly created some of the finest music ever waxed for the classic rock era. 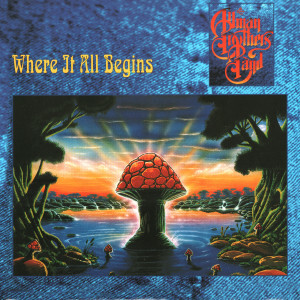 After a long hiatus, The Allman Brothers greeted the 90's with a smokin’ line-up and a great new recording with "Where It All Begins." This stunning release featured a good amount of rock radio classics like "No One To Run With" and "All Night Train" and "Soulshine." More classics abound with Dickey Betts’ & Warren Haynes’ workout on "Mean Woman Blues", the Gregg Allman/Neal Schon/Jonathan Cain classic "Temptation Is A Gun", plus a blues rocker "What's Done Is Done." Friday Music is very proud to announce for the first time ever super limited 180 Gram 2 LP Translucent Gold & Red Swirl audiophile vinyl presentation of "Where It All Begins" by The Allman Brothers Band. Mastered impeccably by Joe Reagoso (Allman Brothers Band/Johnny Winter) at Friday Music Studios and Capitol Mastering in Hollywood and manufactured at R.T.I., this limited edition 1994 classic truly reaches sonic heights courtesy of four sides of first time audiophile vinyl greatness. To further enhance your Allman Brothers Band experience, we have also included a first time striking gatefold cover artwork presentation and a huge 24" x 24" collectible front cover poster. "Where It All Begins" by the great Allman Brothers Band....First time 180 G 2 LP Audiophile Vinyl....From Your Friends at Friday Music!